The 2017 Gonzaga Bulldogs had it. The 2019 Zags definitely have it through 25 games. Basketball seasons inevitably bring ups and downs. Part of the Zags’ formula for success is they keep the downs to a minimum. They’ve obviously had stretches where defense and/or rebounding proved costly or they endured an extended offensive lull, but there hasn’t been a snoozer or no-show performance yet, whether facing a top-five opponent, a WCC challenger or a conference also-ran. 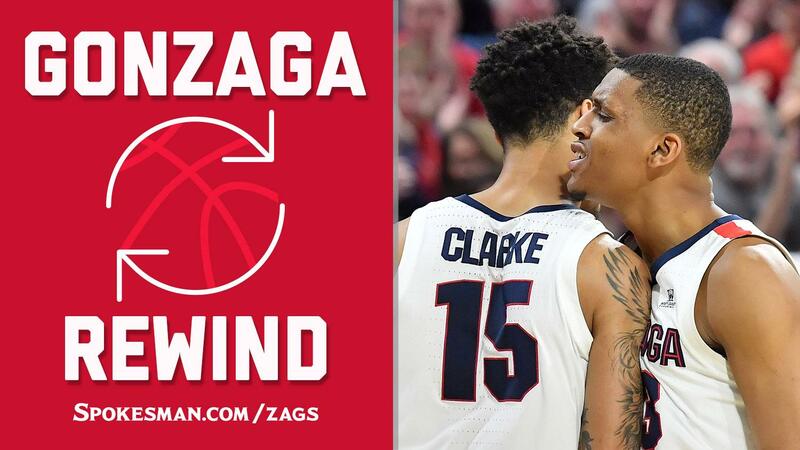 That’s one of the topics in our latest Gonzaga rewind. GU fans could hit rewind for hours re-examining Saturday’s 94-46 pasting of Saint Mary’s, which would prefer the fast-forward button. About the closest Gonzaga has come to a letdown, and it’s a bit of a reach, was a workmanlike 23-point win at Portland. It’s one of the reasons why Gonzaga keeps putting up record numbers. The Zags have seven wins by at least 40 points, the most by a Division I team since Duke had eight in 2001, according to STATS. The 486-point differential during GU’s 14-game winning streak is the best by any Division I team over any 14-game span in the last two decades. Talent advantages can cover up a lot of things, but the Zags have stayed on task regardless of the caliber of opponent. There haven’t been wild fluctuations in their effort or level of play. Human nature suggests that’s difficult to summon game after game. The Zags still lead the nation in KenPom’s offensive efficiency. Their defensive efficiency has climbed to No. 20. Another example of Gonzaga’s sharp focus has been its ability to corral opposing teams’ top scorers. Saint Mary’s guard Jordan Ford came in leading the WCC in scoring. He exited with eight points on 3-of-12 shooting. Forward Malik Fitts had 12 points, four below his average, while making 5 of 12 shots. San Francisco’s Frankie Ferrari and Charles Minlend combined for 28 points on 11-of-25 shooting. BYU’s Yoeli Childs, the WCC’s top scorer at the time, made just three field goals and scored 12 points. The exception was San Diego’s Isaiah Pineiro, who put up 30 points but didn’t crack 50 percent shooting (11 of 23). “We throw a lot of different guys at different players, give them a lot of different looks,” Crandall said. “At some point, you’re going to have to face Josh, me, Jeremy (Jones). We can switch with Rui (Hachimura) and BC (Brandon Clarke), you have to face Corey (Kispert), a bigger guard, and Zach is the same way. The Zags chewed up their four closest WCC pursuers – BYU (93-63), San Diego (85-69), San Francisco (92-62) and Saint Mary’s (94-46) – the last two weeks. Perkins didn’t score a point until 9:16 remained in the second half, but he was at the helm of another offensive clinic. He had nine of the team’s 22 assists as the Zags hit 58.3 percent from the field. Perkins moved up to second on the school’s career assists list with 648. Matt Santangelo holds the top spot with 668. Perkins’ career hasn’t always been smooth sailing, but he’s playing his best basketball this season. He’s averaging 10.4 points and 6.8 assists. His 3.47 assist-to-turnover ratio is in the top 10 nationally. Published: Feb. 10, 2019, 4:38 p.m. Updated: Feb. 10, 2019, 5:48 p.m.